I haven’t been here forever! Since I don’t have a lot of time on my hands now, I am playing with small projects. I was experimenting with felt pins, here is a set of three embroidered flies. You can buy them in my Etsy Store now! And one more, flower branches ebroidered around parts of earings. 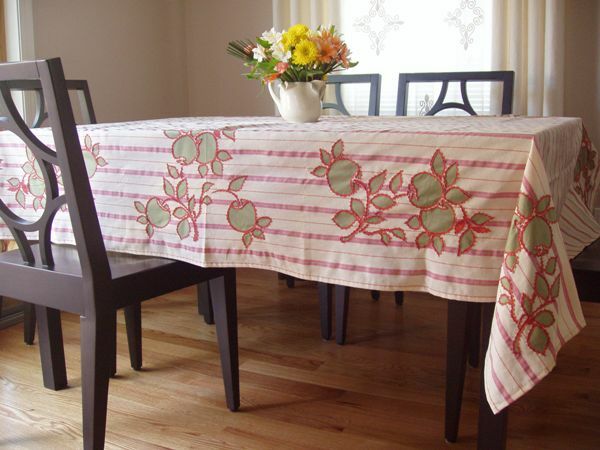 Large old fashion, country style tablecloth with green apple embroidery is hand made using reverse stitch technique I have learned from the Alabama Stitch Book. The top layer is linen: ivory with pink, orange and green stripes. Underneath each motif there is a green cotton jersey panel that was hand stitched to the top layer with red cotton yarn. Each apple branch was hand stenciled using hand made stencils and red fabric paint. 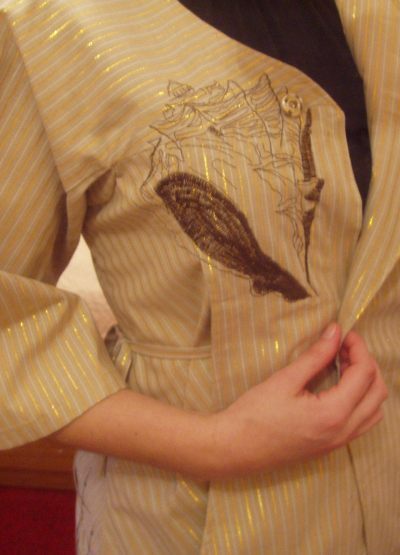 The embroidery runs along both long sides of the cloth. Size: 54 x 81.5 in. Yet, one more Anthropologie inspired creation. 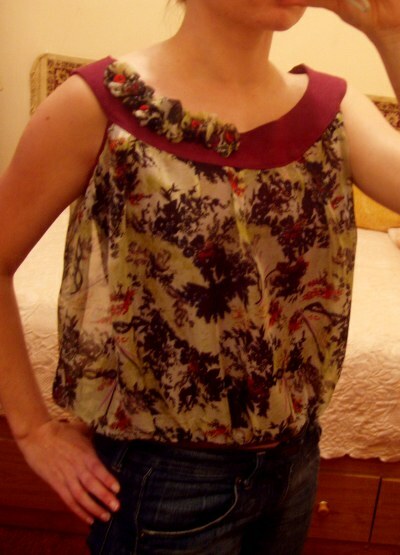 This time the Mill Pond Blouse was my victim. The original has a beautiful embroidery. Instead I have painted flowers using hand made stencils and fabric paint. For anyone interested in fabric painting I have used Folk Art paint. 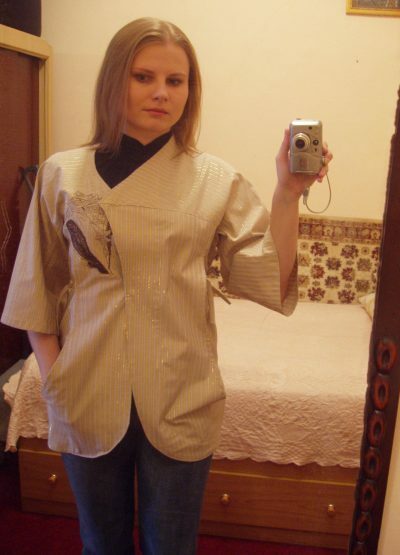 The blouse has been hand washed once in warm water and the paint didn’t bleed or fainted. I recommend it as a fast way to embelish your creations. Fabric- very soft cotton. I didn’t use a pattern. The bottom layer is a cotton tank top made out of a t-shirt because I couldn’t find the right color jersey to match the top silk chiffon layer. I added a simple applique to dress it up a little. I didn’t use any pattern, just played with the fabrics. 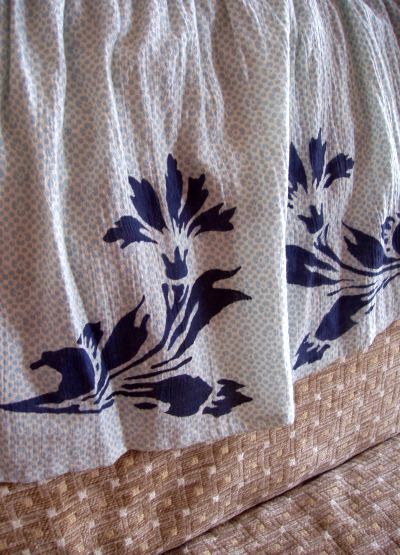 My tulip skirt was inspired by a BCBG dress. I saw it in the store and got so fascinated by the technique that I was standing there, touching it, and dissecting it in my head for some time until I got it. It is easy, but time consuming. At the end you get a flowy bubble effect. 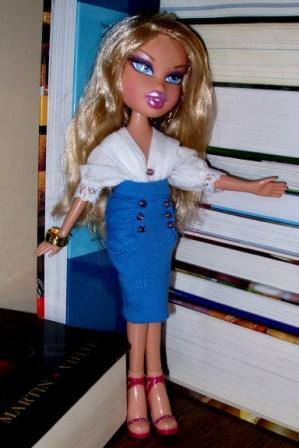 The skirt is made of satin, the wide-waist belt pattern was “borrowed” from Bella Pants. Only glass stands between my Cicia and two doves. I fell in love with Bella and decided to make a short version. 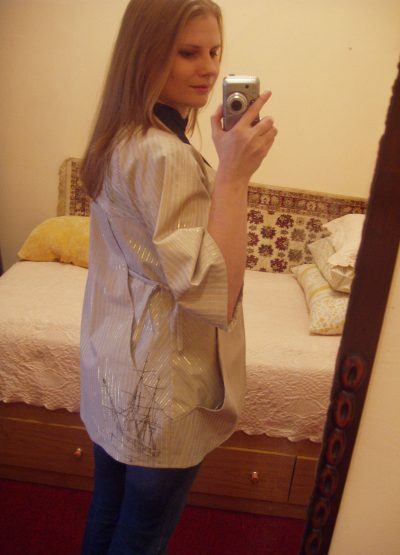 The pattern worked very well, didn’t have to change anything except I used a zipper instead of buttons. I used cotton, dark blue with white pinstripes. I enjoyed playing withe the stripes direction a lot. 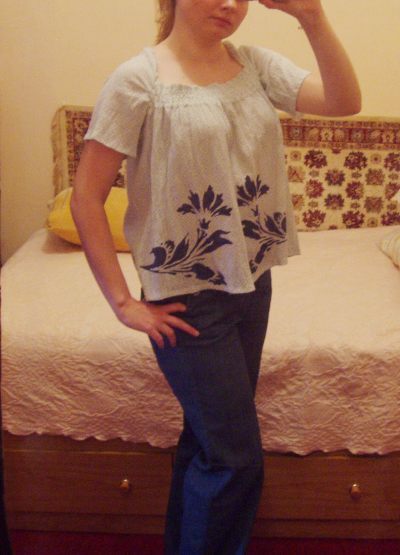 BurdaStyle posted one more pattern of mine; Kasia Skirt. It was a part of my submission for Alice in WorkingLand competition. I get goosebumps when I see my design on a model. I felt that I didn’t have any excuses not to make the Naomi coat,Burda Stylepattern that was inspired by my idea and worn by Naomi Campbell. I really enjoy how it came out, although it wasn’t very easy! It makes a nice summer cover-up. Originaly I wanted to make it nautical; blue and some white accents, but while fabric shopping I saw this natural tone cotton with white and gold stripes, I Knew it was ment for my Naomi. 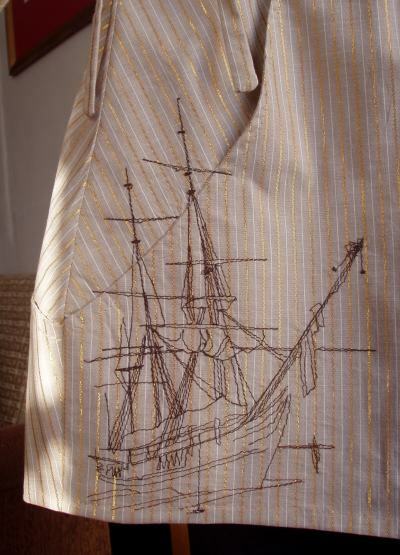 Since I already spend some time searching for the shell and ship pictures for my nautical embroidery I decided to apply them as well. Overall I think this way is better than my original idea. Read about my Naomi here. It was a quick knit, taking under consideration the size of the dress. I managed to complete it in one weekend. The dress had to be hand knitted because the yarn was too bulky for my sweater machine. 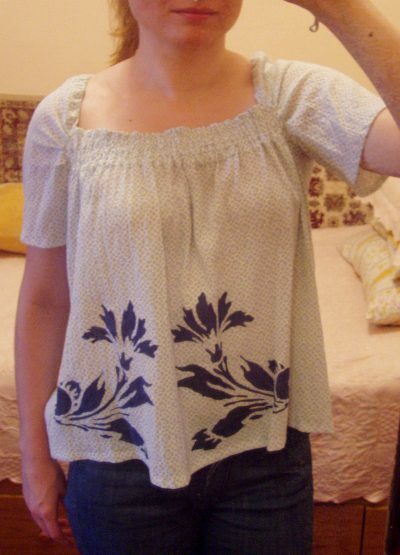 The pattern was easy to follow, the only change I made was to make the length and the sleeves shorter. 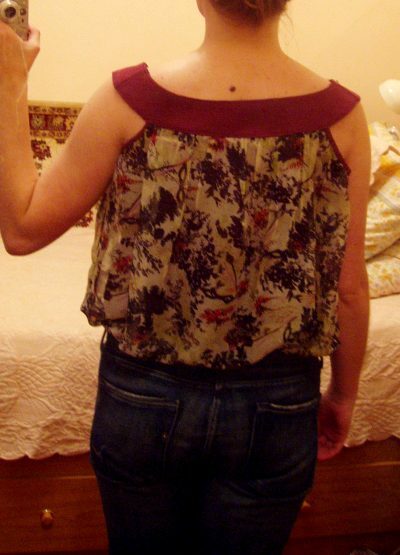 It looks good over some jeans, but I loved the original look over a dress, so I decided to make a simple jersey lining. It is a tank top dress with a wide bottom. And a recent little painting. I was trying to paint on wood, experimenting with it and oils. I struggled a lot, but I have learned a lot as well. Maybe the next one will be better.